For the first time, Tech’s Student Center Program’s Council (SCPC) has invited a female comedian, Nasim Pedrad, to their annual comedy show. Nasim Pedrad was recently on “Mulaney” and is better known for her five seasons on “Saturday Night Live.” She was recently allowed to shoot a pilot for her show: “Chad: An American Boy,” a story about a young Iranian American boy, to be played by Pedrad herself, balancing his two lives and finding his identity. Even with these other endeavors, Nasim Pedrad found time to grace the stage of Tech’s Ferst Center for the Arts on Tuesday, Feb. 16. The show started at 8 p.m. with two hilarious opening acts, Ali Foreman, a student from Tech, and Maggie Maye, a comedian from Austin, Texas. After these two comedians invited the audience to laugh with their acts, the star of the show, Nasim Pedrad, came up on stage. Her show consisted of a walk through her life rather than a typical stand up set. With an accompanying slideshow on display to emphasize a few points such as a childhood passion for visors and a particularly tragic Dora the Explorer costume, Pedrad talked about her experiences as a young comic and her years on “Saturday Night Live,” which was full interesting anecdotes of late nights and interactions with celebrities. The comedian then told the audience about one particularly memorable night of filming when she ended up chipping Justin Timberlake’s tooth and another day when she did her Kim Kardashian impression in front of the socialite herself. Towards the end of her set, Nasim Pedrad brought six stools onto the stage as well as a set of scripts for a sketch that had never made it into an actual “Saturday Night Live” show. She then selected six students from the audience to play these roles. In an interesting twist not only were those selected going to portray the characters of the actual sketch, but also the personas of the comedians who would have portrayed those characters. The students read off of the script and brought a sketch which included Dwayne “The Rock” Johnson and two extremely bored adults to life, complete with the appropriate acting and some stunning prop work. At the very end of her set, Pedrad opened the floor to questions from the audience, and a few students asked her about her experience as a comedian who started her career in Los Angeles. At another point, one student asked Pedrad how her parents reacted to their daughter choosing to go into comedy, and another asked how to go about becoming a comedy writer. In response, Pedrad emphasized the importance of hard work and stated that if someone really wants to do something, they have to go for it with all they have. They have to practice whenever they can, and when others see that passion and hard work paying off, they will respect you for it. 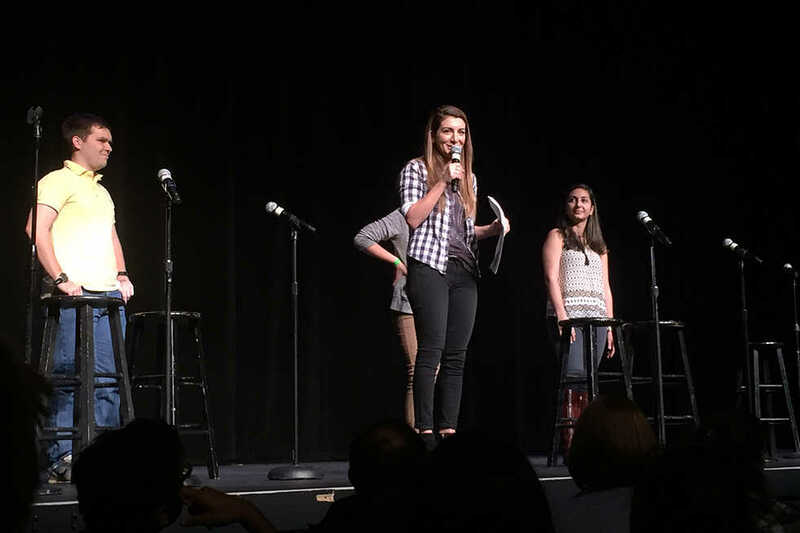 Overall, SCPC’s spring comedy show was a success for women on campus. All three acts were women, which is a rare occurrence in this genre of performing art. This refreshing aspect brought together a fresh young crowd. Their comedy was a blend of the everyday experiences of women, and for Maggie Maye and Nasim Pedrad, their experiences as women of color in the entertainment field.